The Gulf Stream importance in the global climate thermoregulation processes is well assessed. The latest real time satellite (Jason, Topex/Poseidon, Geosat Follow-On, ERS-2, Envisat) data maps of May-June 2010 processed by CCAR1,2 (Colorado Center for Astrodynamics Research), checked at Frascati Laboratories by the means of the SHT congruent calculus3 and compared with past years data, show for the first time a direct evidence of the rapid breaking of the Loop Current, a warm ocean current, crucial part of the Gulf Stream. 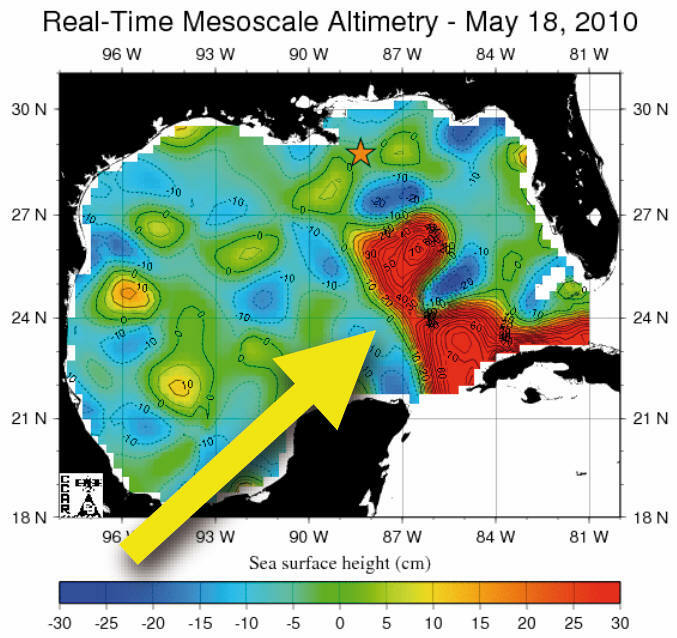 As displayed both by the sea surface velocity maps and the sea surface height maps, the Loop Current broke down for the first time around May 18th and generated a clock wise eddy, which is still active (see Fig. 1 below). “Deepwater Horizon”. The yellow arrow indicates the breaking of the Loop Stream. As of today the situation has deteriorated up to the point in which the eddy has detached itself completely from the main stream therefore destroying completely the Loop Current, as in figure 2 below, dated June 12, 2010. The star indicates the site of BP platform "Deepwater Horizon". The yellow arrow indicates the breaking of the Loop Stream. Since comparative analysis with past satellite data until may 2010 didn't show relevant anomalies, it might be therefore plausible to correlate the breaking of the Loop Current with the biochemical and physical action of the BP Oil Spill on the Gulf Stream. 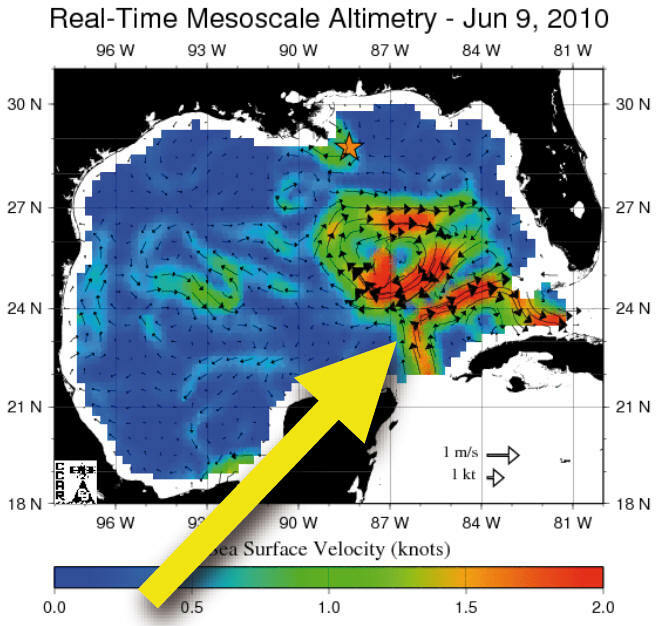 It is reasonable to foresee the threat that the breaking of a crucial warm stream as the Loop Current may generate a chain reaction of unpredictable critical phenomena and instabilities due to strong non linearities which may have serious consequences on the dynamics of the Gulf Stream thermo-regulation activity of the Global Climate. the maps displayed in Fig. 1 and 2 were produced by the Colorado Center for Astrodynamics Research at the University of Colorado, Boulder, USA. More information on these data products is available at http://argo.colorado.edu/~realtime/welcome/.